The [[Protagonist|protagonist's]] name is [[Claude Speed]]. The game takes place in [[Anywhere City]], which is divided into 3 sectors - [[Downtown District|Commercial]], [[Residential District|Residential]] and [[Industrial District|Industrial]]. In each of them there are three gangs, whose bosses give the player missions via payphones. 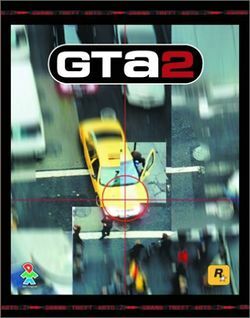 Each district also has a maximum [[Wanted Level in GTA 2|wanted level]] that the player can aquire, likely to make later levels more difficult. The Commercial District allows a maximum wanted level of four, which results in the S.W.A.T. 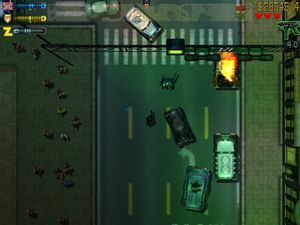 team chasing the player, however, the Residential and Industrial districts allow a maximum wanted level of six, which results in the F.B.I. and the army chasing the player. To save the game, the player needs to find the [[Jesus Saves]] church. It can only be found by listening out for the organ playing or by hijacking a [[TV Van]] (the antenna on top always points towards it). However, once at the church, the player needs to pay $50,000 to save, so it's best not to save until turning off the game. However, completing 2-3 missions will easily reward the player with enough money.